Some say club stability is the key in achieving long-lasting milestones. Others cite injury-free runs, good form and selection. Toronto Dingos founding member Paul Tinkler has conquered all of those things. 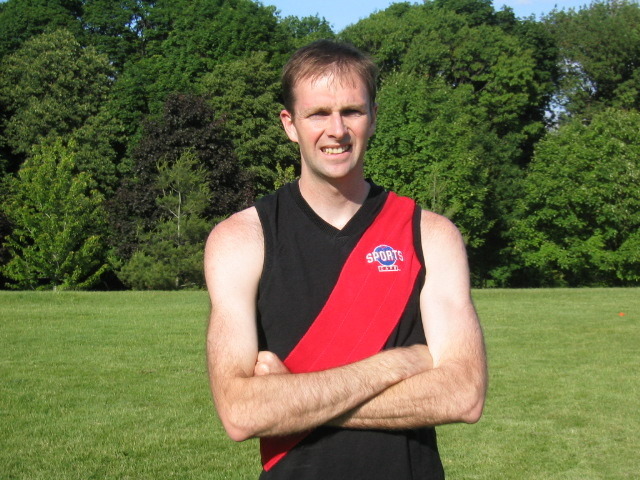 This weekend marks his 200th Australian Football League Ontario match for the Toronto Dingos against the Ottawa Swans at Humber College South (ball-up is at 3pm Saturday August 24th). Legend has it, in 1995 during a football trip to England five mates raised the idea of entering a team in the now defunct Canadian Australian Football Association. Tinkler came up with the name “Downtown Dingos” and the others agreed that would be the name of the club; a mix breed of Australians and Canadians. After some recruiting from local teams the Dingos were born in 1996 and finished fifth in their inaugural season. Tinkler has been part of the furniture at Dingoland ever since that year and has seen the league ebb and flow and been part of the high-flying times and all the struggles that come with playing football in Canada. The lanky left footer, affectionately known as simply “Tinks” or Tinkalator”, has spent more than 20 years playing football in Ontario, as a player, coach, president, vice president, umpire and club mentor to incoming Canadians. The New South Welshman has played all the way up the spine, but has found home up forward. His Dingo record and accolades run deep: Tinkler has kicked 257 goals for the Dingos (197 for Div.1 and 60 for Div.2); is a two-time Dingo best and fairest; a five-time club goal kicking winner; a two-time clubman recipient; a Div.2 league best and fairest; along with other various All-Star teams selections. The greatest stat of all, if you ever ask him, and he’ll tell you, is the entire six Dingo premierships he’s played in. President of the Toronto Dingos, Justin Robertson, said off the field, Tinkler continues to volunteer his time, which is hugely vital in running a club. This year, Robertson said, he donated to the club a $50 weekly prize called the “Pewter” Award for best on ground and he was also instrumental in organizing the club’s 2oth Anniversary celebration, attended by alumni and family, a couple of seasons ago. Former OAFL president and vice president Dave Wells, who started playing for the Dingos in 2004, recalls how Tinks was invaluable in helping shape the club’s division two team, along with a handful of other senior Dingos. In his own frank self-assessment, Tinkler knows his last game of football is just around the corner, but the competitor in him will want to add his all-time 257-goal tally on the weekend against the Swans. But if he doesn’t add to his tally, he’s just as happy having a beer after the game with his Dingo teammates and the club he helped dream up.